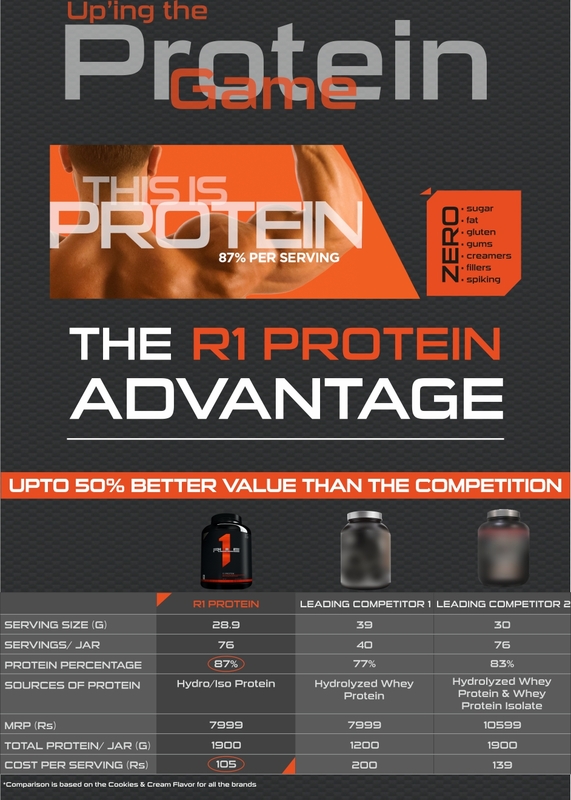 R1 protein is made of 100% Hydro/ISO protein, and virtually nothing else. It has Zero whey concentrates as well as creamers, gums, amino spiking, and other fillers that dilute what you really came for – protein. The result is an industry leading Protein Purity Percentage (PPP) of up to 87%. 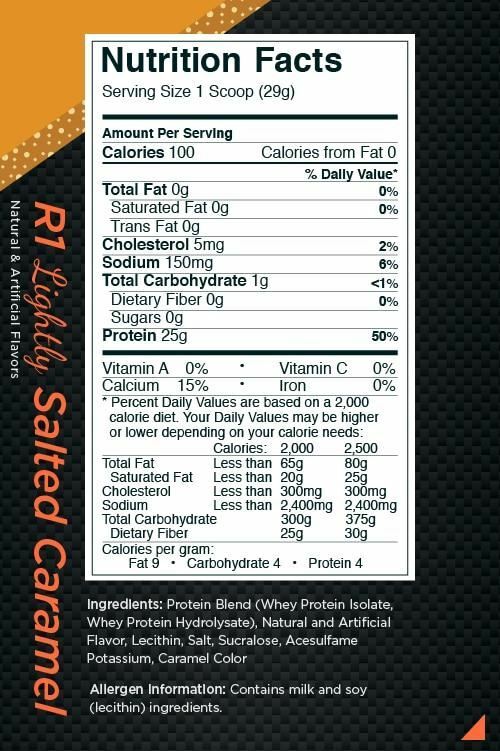 R1 Protein is protein with a capital-P.
An 87% protein ratio - vs. top-sellers. 25g of Hydrolyzed Whey protein from ultra-pure Whey Isolates. Protein Requirement for a sedentary individual is 0.8-1g/kg body weight. However, for an exercising individual, the requirement increases up to 1.5-2g/kg body weight depending on activity levels. Therefore, depending on your daily protein requirement and intake through diet, you can increase the number of servings to be taken throughout the day. For e.g. : If you have 120g as your daily protein requirement and you are able to consume 60g of protein through your diet, then the rest of the protein deficit can be fulfilled by consuming 2-3 servings of protein supplement. Mix 1 serving in 200 ml of water. Shake vigorously for 30secs for smoothest consistency. You can increase or decrease the quantity of water based on how thick or thin you want your protein shake to be. For a better shake use room temperature water. The colder the water the more the protein coagulates and makes a thicker shake. Also to avoid powder from getting stuck to the shaker, add water first and then add protein to water. The ideal times to consume R1 PROTEIN is - first thing in the morning and post-workout, so as to stop catabolism (breakdown of muscle) and kick-start anabolism (muscle synthesis) respectively. Apart from the above mentioned times, R1 PROTEIN can also be consumed with/in-between meals to meet up daily protein requirement. Q.1 What is R1 PROTEIN? A premium quality Whey Isolate protein. 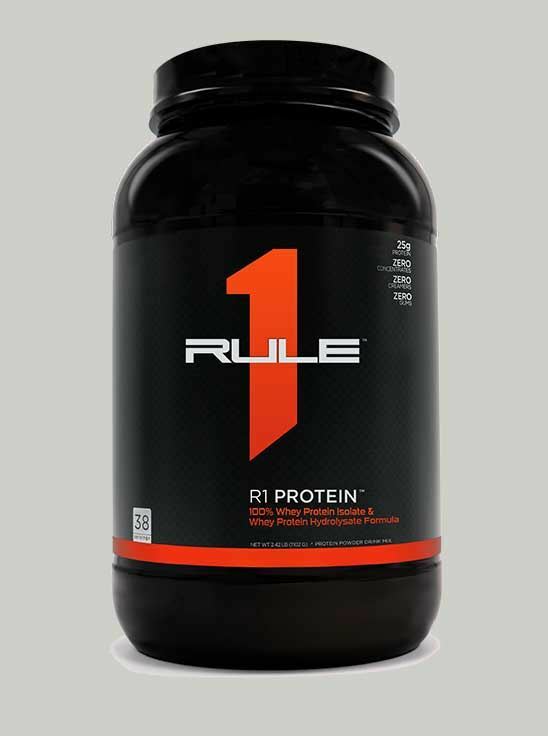 R1 PROTEIN provides 25g protein per serving from ultra-pure Whey Protein Isolates + Hydrolyzed Whey Peptides along with 6g+ of BCAAs for better muscle building and recovery. 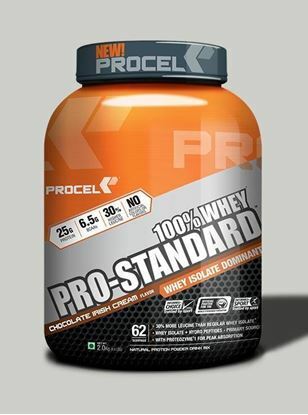 Q.2 What is Whey Protein Isolate? Whey Protein Isolate has a higher percentage of proteins which rounds to almost 80-90%. Higher concentration of protein is the result of the processing it undergoes i.e. either Cross flow Micro-filtration and Ion- Exchange. These processes help to separate protein from lactose, fats, ash and minerals. Whey Isolate has minimum amount of lactose, fats, ash and minerals in comparison to whey Protein Concentrates. Whey Protein Isolate is a fast acting protein and the body digests it within 30 minutes of consumption, the property to digest fast helps to repair damaged muscle tissue and aids in faster recovery. Whey Isolates have much lower amount of lactose than Whey concentrates, thus a great choice for lactose sensitive individuals. Q.3 What is Hydrolyzed Whey Protein? Hydrolyzed whey is derived from whey protein isolates through partial break down (pre-digested) of long amino acid chains into smaller chains (dipeptides or tripeptides) so that they get into your system faster. As they are sourced from Whey protein isolates they have zero fat and lactose content. Q.4 Is R1 PROTEIN suitable for consumption for vegetarians? It is derived from milk. Q.5 Is R1 PROTEIN easy to digest? It is very easy to digest. Q.6 What is the ideal time to consume R1 PROTEIN? The ideal times to consume R1 PROTEIN, first thing in the morning and post-workout, so as to stop catabolism (breakdown of muscle) and kick-start anabolism (muscle synthesis) respectively. Apart from the above mentioned times R1 PROTEIN can also be consumed with/in-between meals to meet up daily protein requirement. Q.7 If R1 PROTEIN is a protein derived from milk, why cant I meet my protein requirements from diet alone? Q.8 Since R1 PROTEIN is a protein powder; do I still need it if I eat chicken, fish on a daily basis? 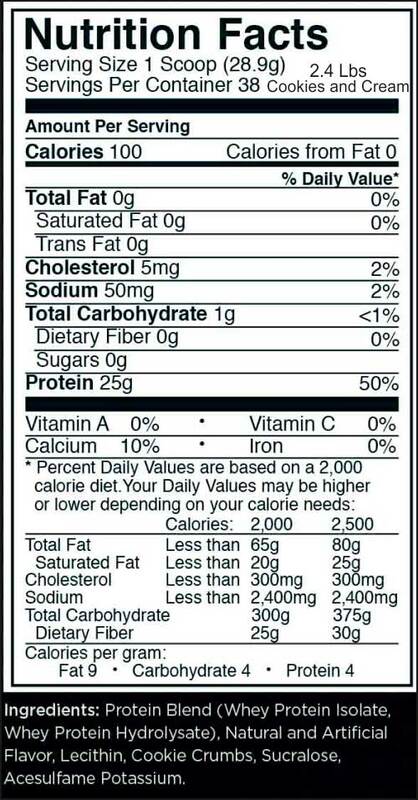 Although protein requirement can be met through whole foods, sports nutrition demands emphasis on certain meals viz. pre-workout/post-workout for optimum muscle gain. Since the body is not equipped to handle whole foods during these crucial periods, whey based protein supplements are an ideal per-workout or post-workout meals. Also, if there is a long gap between waking time and breakfast, then taking whey protein immediately upon rising can help arrest catabolism and kick-start muscle anabolism. It is the protein powder category of supplements that makes sports nutrition possible for the average fitness enthusiast and competitive athlete. Q.9 Will R1 PROTEIN cause weight gain? Whey protein helps in muscle gain by repairing the torn muscle tissue and increasing its size (hypertrophy). Thus the weight gain seen will be in form of muscle gain and not fat gain. Increased muscle mass will lead to increase in BMR and therefore increase fat burning as well. Q.10 Should I consume R1 PROTEIN in milk or water? R1 PROTEIN should not be mixed with milk, as there is no point in increasing the lactose load by having in milk. Hence, consume it in water.